Dune 45 is named for its proximity to Sesrium Gate. It is situated 45km from the gate, along a paved road and is easily reached using a 2×4 vehicle. Its fascinating shape and accessibility makes it the most photographed dune in the world. 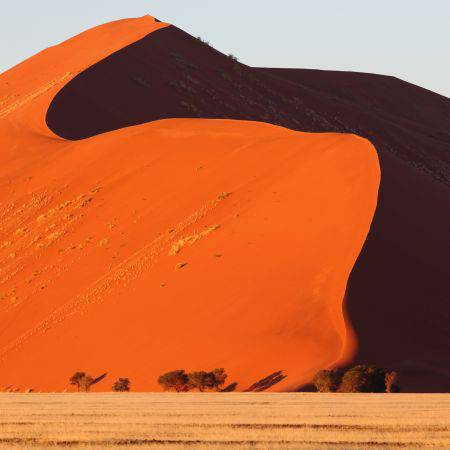 The dunes of the Namib Desert were created by sand carried by the wind from the coast of Namibia. The sand here is 5 million years old and is red in colour due to its iron oxide conten. As the lighting changes with the time of day, so does the appearance of the dunes’ characteristic colour, allowing for interesting photographs at any time. The wind in the Sossusvlei area blows from all directions, which means that the type of the dunes hare are known as “star dunes”. This is because the winds cause the sand to form a star shape with multiple arms. Visitors are allowed to climb Dune 45, so be sure to visit early in the morning to watch the sunrise over the vlei from the top of the Dune. The Dune is 85 meters high and the climb is well worth the effort as from the top you will be spoilt with the incredible panoramic view of Dune Valley. In the morning and evening light the floor of the pan has been described as a “moonscape” and is truly a sight to behold. Deadvlei is a paradise for photographers as the contrast between the pitch-black trees and bleached-white pans, and the rusty-red dunes and deep blue sky make for incredible images.